Don and I were married in 1999. After much waiting and praying we got our wish of having a baby in May 2005 when our triplet boys were born. Finally, we were blessed with our big, happy family. Yesterday was Mother's Day, and you boys and your dad really did a great job of making me feel loved and appreciated. You gave me great presents like a quilt kit I wanted, chocolate strawberries (yum! ), jewelry and a great book. We met Nana for breakfast. Michael and his girl friend KaLinna moved to Vegas last month so they joined us along with Ryder. It was a fun and relaxing time. Nana with most of her grandsons. I can not even think of ways to tell you boys how much I love you. I read something the other day and it summed up almost my love for our little family. "They are the beat of my heart, the pulse in my veins, and the energy of my soul. 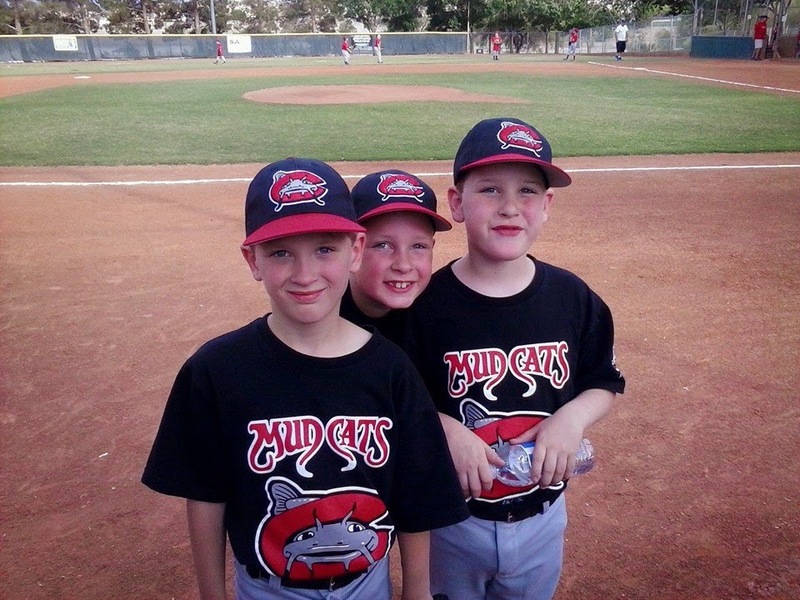 They are my kids"
So we finally got you boys into baseball! It has been quite the experience, but seems to be a good one. What's great is that the field you usually play at is the one near Nana and Pops house. We have driven past that field for about 20 years, so it is so fitting that our kids are FINALLY playing at that field! The first game overlapped a fun school function and you guys were MAD to miss that function! After all, you only get 2 or 3 a year and you were looking forward to it. But being that our family has 3 players from the team, your dad and I had to stay strong that going to the game was the "right" thing to do. Oh, it was so hard sticking to our guns, but it worked out in the end. All three of you loved playing the game, and when the game was over you understood why we needed to be there -and even better- you were glad we went to the game! Mostly you are played in the outfield positions, but that is expected since this is the FIRST time you have even played baseball. At the baseball ratings they had everyone run the bases and the three of you ran around the bases, never actually tagging one with your feet. It was hilarious and you have come far from then in just the past 6 weeks! Last game both Lucas and Jaxon got to play third base! Wyatt didn't get to play at all because of his broken arm, (and last game because of his ear surgery, and sometimes because of his belly) but we will get to that another time. Your dad and I love watching you boys play. We love the excitement in your eyes when you are on base and cheering you on while you bat. I especially love while Lucas is batting and his nervous looks back to Don and I after every pitch or Jaxon's big smile when it is his turn to bat. Wyatt found a giant clam that he and Lucas tried to keep the seagulls away. For spring break, we went camping at San Clemente. The weather was a bit off the first day, so we decided to show your Dad Coronado Island because we thought he'd love the low incoming jets. The weird weather kept away lots of beach goers, but it got us a prime parking spot and lots of running room to play in. There must have been a low tide or something because there was a secondary beach like area on the right side of where we were. It was a beachy area, and then it would get about knee deep and then beachy again. We each spotted sand dollars and other pretty shells. Our campground spot wasn't much to look at when we pulled up, but we are learning how first looks can be deceiving. There was plenty of space for everyone to have fun. The boys played in a small wooded area and swung around on the swing we keep in the camper. It was the first time sap came out of the tree and landed in the kids hair, but we dealt with that too :) It's all part of the experience, right? The next day we were back at the beach. Lots of gross seaweed fun and jumping through the waves. The water was so cold, but boogie boarding was enjoyed as usual. This year we had a cootie travel with us. It caused some unexpected pit stops on the drive up to San Clemente, but once we got there, the vomiting stopped to about once a day. It rotated between Lucas and Jaxon, Wyatt was lucky enough to not catch it. We found a sand couch! There is no where I feel more relaxed at than the beach. The sound of the waves, the breeze and sunshine just makes me at peace. I love that you boys seem to love the beach as much as I do. There is always something to do- be it playing in the water or playing in the sand. One day your dad will love it as much as we do :) Or at least the memories will be worth it for him. While we were on vacation, there was a lunar eclipse they called the "blood moon". We stayed up to see the moon turn dark, but the day of sun and surf wore us down and your dad and I went back in the camper before the eclipse turned red. One of the days in California, we decided to spend the day in LEGOLAND. It was lots of fun, as usual. Wyatt was finally tall enough to do all the rides alone! He didn't seem too excited about it, but we were excited for him. This meant Don and I spent more time hanging out and watching the boys on their own. All of them alone! Check out Jax's driving feet. One of our first time at LEGOLAND, Don tried this ride with the boys. They only allow 4 people, so back then it was 3 5 year olds. Man, it was hard work for Don then! This time it was much more enjoyable for all 4 of them with three 8 year olds with big muscles! My handsome guys!! Jaxon won that Pikachu with his own money. Your Dad and I got to try to get you wet with the water bombs! We all really enjoy going to Boulder City. It is a little town past Henderson that just has lots of old town charm to it. This time we went for a VW car show, and then to go fishing at Veterans Park. The VW show gave you and your Dad lots of ideas about different colors to paint the Bug. Unfortunately being that we had Roxy with us and you guys stayed up late last night at Nan's, it wasn't a good recipe for just hanging out at the show so we didn't stay long. So after some great pizza and garlic twists, off to Veterans Park we went. It was your third time fishing, but for whatever reason (we blamed the bad bait) we didn't catch any fish. We still had a good time trying. The weather was perfect, it was relaxing, and Roxy was glad to be hanging out with us. This year you had all decided you were going to get Spring pictures at school. They had better backgrounds you said. Well, your dad and I had already paid for Fall pictures and we compromised that if you wanted Spring pictures, you would have to pay for half. To our surprise all three of you ponied up the money and totally took pride in your pictures by dressing up on picture day.